OKI MICROLINE 3320 BASIC PRINTER. 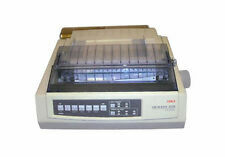 1 x OKI ML3320 Dot Matrix Printer. Basic Printer With Platen Knob. Print Head & Ribbon. Ideal To Replace A Faulty Unit (As Shown In Photo). If you need help with your installation our engineers will be happy to help you. 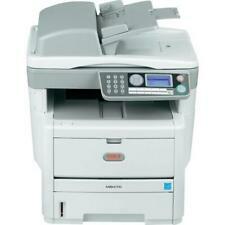 OKI ML5520eco Standard Printer. Condition is Used. purchased for business venture which didn't happen, Good used condition was working when I bought it. Sold as seen. Dispatched with eBay delivery – Shutl 1 day. OKI B431DN A4 MONO LED PRINTER. 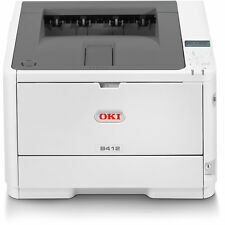 1 x OKI B431DN Printer. This Is A Grade A Printer. We are one of the largest printer dealers in the. Islands and. Northern Ireland . UK mainland and excludes. If you need help with your installation our engineers will be happy to help you. 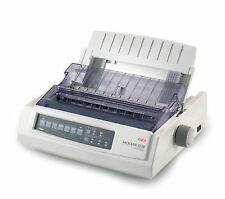 OKI MICROLINE 321 ELITE LONG CARRIAGE DOT MATRIX PRINTER REFURBISHED WITH 6 MONTH RTB WARRANTY. Superb fast dot matrix printer. Printer has been fully dismantled and thoroughly cleaned. As with all our refurbished printers the following work has been completed. OKI B6500DN. 1 x OKI B6500DN. Fast Network & Duplex Ready A4 Mono Laser Printer. Duplex Unit. USB, Parallel, Serial & Ethernet Connection. Connections;USB, Parallel, Serial & Ethernet. Printer Specification. Automatic Duplex Printing (2-Sided). USB 2.0, Ethernet and Parallel Connections. Print up to 38 Pages Per Minute. We will always go out of our way to source the product you are looking for. 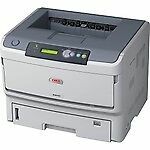 (OKI C9655 Large Format Laser Printer | Digital 4 LED Full-color. 3) A van or large car will be required to move the printer. 1) This printer is currently located in. 2) This printer will need to be moved by at least 2 people due to its weight. 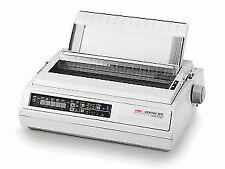 OKI Microline 590 Elite Dot Matrix Printer. The Printer Broker Ltd is a supplier of printers, fusers and printer parts based in Bolton, Greater Manchester, UK. Automatic Duplex printing ( 2-Sided). USB, Parallel & Ethernet connections. Print up to 40ppm (Mono). Add to Favourites. We will always go out of our way to source the product you are looking for. USB, Parallel & Ethernet connections. Print up to 34ppm Colour. Print up to 36ppm Mono. We will always go out of our way to source the product you are looking for. Add to Favourites. OKI 45858301?. With OKI,there’s no need to compromise between price and performance. Tech Data Product Data Sheet - OKI B412dn(45858301?). Product Data Sheet - Brochure - OKI B412dn(45858301?). Once you start using the B412dn you’ll wonder why other printers aren’t built this way. 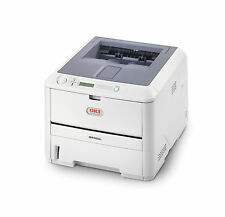 OKI B401DN printer. Automatic Duplex Printing (2-sided). OKI C9655DN. 1 x OKI C9655DN Printer. A3/A4 COLOUR LED PRINTER. This Is A Grade A Colour LED Printer. We are one of the largest printer dealers in the. Northern Ireland . UK mainland and excludes. If you need help with your installation our engineers will be happy to help you. 1 x OKI B4350. USB and Parallel A4 Mono Laser Printer. Personal Compact Desktop Printer. Connectivity: USB & Parallel. Print Speed: Up to 22 ppm Black. Warranty ; 6 Months RTB Warranty. 1 x Power Cable. Part : MB470. The Printer Broker Ltd is a supplier of printers, fusers and printer parts based in Bolton, Greater Manchester, UK. Picture for illustration purposes only. USB, Parallel & Ethernet connections. Print up to 37/30ppm (Mono/Colour). We will always go out of our way to source the product you are looking for. Add to Favourites.